―In June this year the Fifth Tokyo International Conference on African Development (TICAD V) was held in Yokohama. About 40 heads of State and other top-level representatives from 51 African countries visited our city. It was a great opportunity to get Yokohama better known in the world. As a host city, Yokohama has successfully held such large-scale international conferences as TICAD and the Asia-Pacific Economic Cooperation (APEC) Leaders’ Summit, and was so highly praised that it was selected as a Global MICE (Meeting, Incentive, Convention, Event/Exhibition) Strategic City representing Japan. PACIFICO Yokohama, Yokohama's core convention facility, is highly valued in and out of Japan. Nearly 150,000 people visit PACIFICO Yokohama every year to take part in international conferences; in terms of the number of participants in international meetings to a single facility, it ranks first in Japan. Nagoya Congress Center ranks second with a little under 90,000. You can easily imagine PACIFICO Yokohama is a very important core for conferences. We always greet visitors with a sense of "omotenashi" hospitality. ―What efforts are you making using Yokohama's well-known name? A "Culture City of East Asia" project will start in January 2014. In this project, selected cities in Japan, China and the Republic of Korea (ROK) to carry out cultural and art events and strengthen international transmission of the diverse cultures in the region, with the 3 countries cooperating with each other. 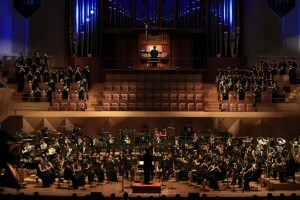 The City of Yokohama was selected as the city to carry out this project in Japan. I had a chance to talk with representatives of Gwangju Metropolitan City in the ROK and Quanzhou City in China, both of which were selected with Yokohama. We agreed to initiate cultural exchanges between citizens and in collaboration between the selected cities. Throughout 2014, Yokohama will carry out fascinating cultural and art events, including the Yokohama Triennale contemporary art festival. 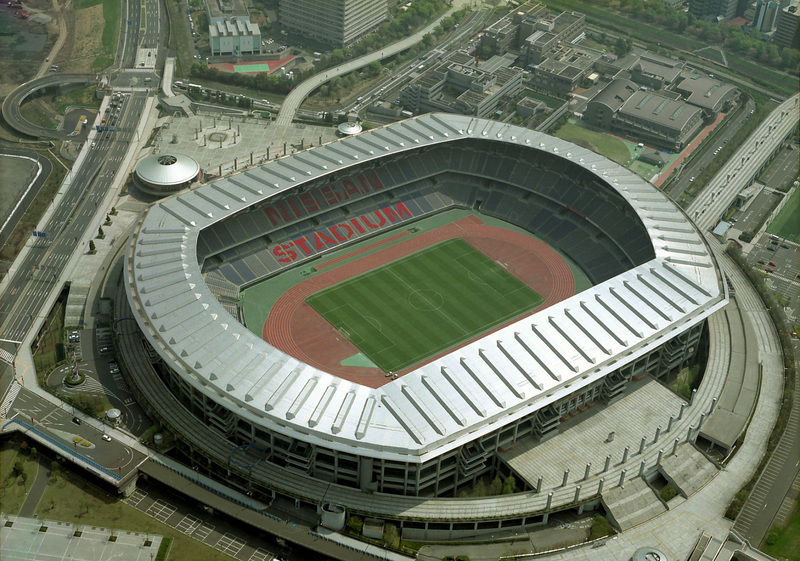 ―The government designated Yokohama as a core city in many fields. This gives Yokohama a big boost, doesn't it? As global competition among cities is getting fiercer, it has indeed produced a synergistic effect for activating Yokohama. That the city was designated as an "Internationally Strategic Container Port" has given an impetus to Yokohama Port and 2 other ports in the Keihin district to strengthen their port functions. Compared with 20 years ago, the ports of Singapore, Shanghai and Busan have gained an overwhelming lead over Yokohama in terms of the cargo volume of containers. To catch up with them, I am playing a leading role in selling Yokohama Port to shipping companies. The sight of the port busy with passenger vessels is also a precious asset to our city. Not only in Japan but in East Asia nowadays, cruises are very popular. A cruise used to have a very expensive image in the past, but recently a 7 to 10-day cruise is available at about 100,000 yen (approx. 1,000 US dollar). 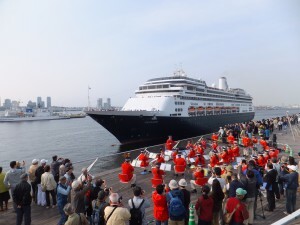 Yokohama has been Japan's No.1 anchorage site for the past ten years partly because maritime companies and travel agencies in and out of Japan have been intently offering tours that start at and return to our city. 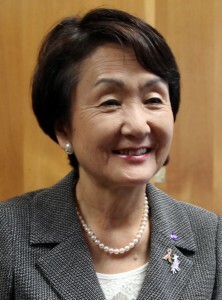 ―You are making efforts to turn Yokohama into a low-carbon city. As an environmental "FutureCity" designated by the national government, Yokohama has been working on building a sustainable city. 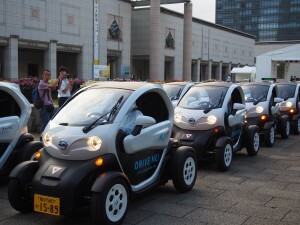 In October, we started "Choimobi Yokohama," a future-oriented car sharing system. This is an eco-friendly traffic system using lovely two-seated electric cars; we have established about 70 stations in the city centering on the Minatomirai district to make tourism, business and day-to-day transportation more convenient. We are also putting our emphasis on increasing the visibility of electric power; more than 1,900 households have already installed the Home Energy Management System (HEMS). Since its port opened, Yokohama has been a city full of stories of "the beginning of things and initiatives," and has a history of outstanding infrastructure development and technology; Yokohama was the first city to build a sewerage system in Japan. The Minato Mirai 21 district is the central part of the reclaimed waterfront that was created 30 years ago as a new landmark of Yokohama. In addition to such urban development, Yokohama has an excellent record in terms of water supply, sewerage technologies, and waste disposal. These technologies are desperately needed at a time when cities in the emerging countries are getting bigger and bigger, and they are very much interested in our knowhow and technologies. 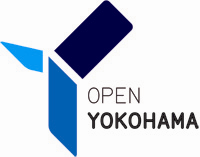 We have started the "Y-PORT (Yokohama Partnership of Resources and Technologies) Project" for international contribution and to give business opportunities to firms in Yokohama. Currently, we are assisting them in dispatching engineers or carrying out training. ―What is your idea about information transmission? My former career was in sales. Including my manager days, which lasted about 10 years, I developed new customers to sell products to in the retailing industry. A sense of "sales" was not in the culture of the city government, but my persistent urging has been changing each officer into a sales person. Our basic attitude is that information should be sent out not only from the PR department but from each one of us, as a billboard, through every project. After my inauguration, I reorganized the city office. Three years ago, I made the Culture and Tourism Bureau independent from the former Economic Affairs and Tourism Bureau. The newly established Culture and Tourism Bureau, which is now functioning very well, connects culture and arts, and is a key to the growth strategy with tourism policies such as the creation of new attractions and the promotion of Yokohama. Before that time, there had been a distance between the public sector and the private sector, and the city administration had been vertically divided, but then it became possible to carry out cross-bureau projects centering on the Culture and Tourism Bureau. We are actively sending out information in a non-traditional manner also, utilizing ICT. As a municipality, we also have an advantage in that we grasp directly what the people who live and work in this city want us to do. After the national government sets laws and policies, it is up to us to realize them by linking them with the citizens' daily life. As we are making efforts considering the details of citizens' lives, our information transmission is sound and very appealing. ―How are you working on overseas public relations? It is important to take every opportunity. When I go abroad for a conference or when foreign business executives come to Japan, I am the top salesperson and visit them myself to invite their business to Yokohama or brief them on Yokohama. It is of the utmost importance that the head of a municipality publicizes it. FPCJ is an important and vital partner for sending out information overseas. Thanks to FPCJ and others, I realize Yokohama's presence has been on the rise. On November 20, FPCJ's Press Tour “Yokohama spearheading Japan’s efforts for empowering women and better childcare” brought foreign journalists to Yokohama. I am sure that their reporting, meant for a foreign audience, is effective. ―How have you promoted the name of Yokohama? As I want to create things that can be seen only in Yokohama, I put emphasis on cultural aspects as well as urban development. 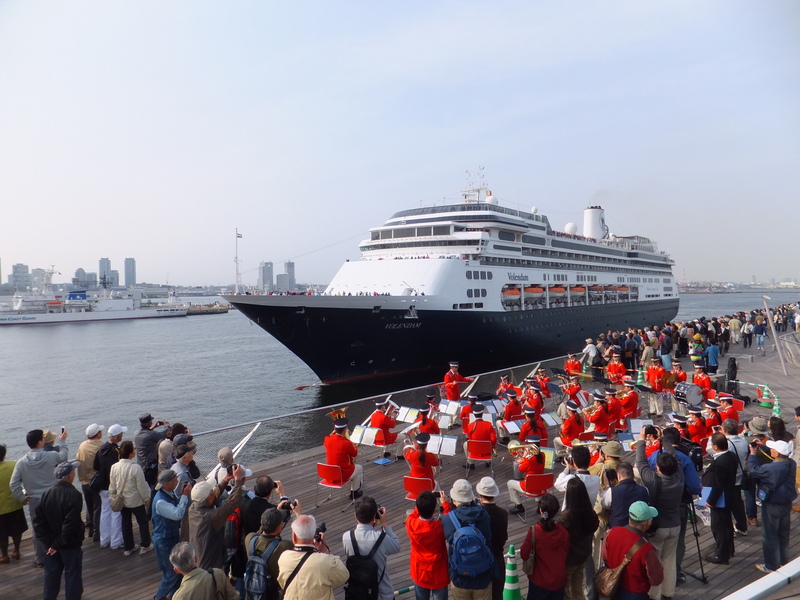 Last year, we carried out "Dance Dance Dance @ YOKOHAMA 2012" and 1.25 million people visited our city. During about 2.5 months, we conducted dance events of every genre. Dance needs no words. Foreign visitors were especially happy. I wish people in the world could have an image that Yokohama is full of arts at this time of the year. 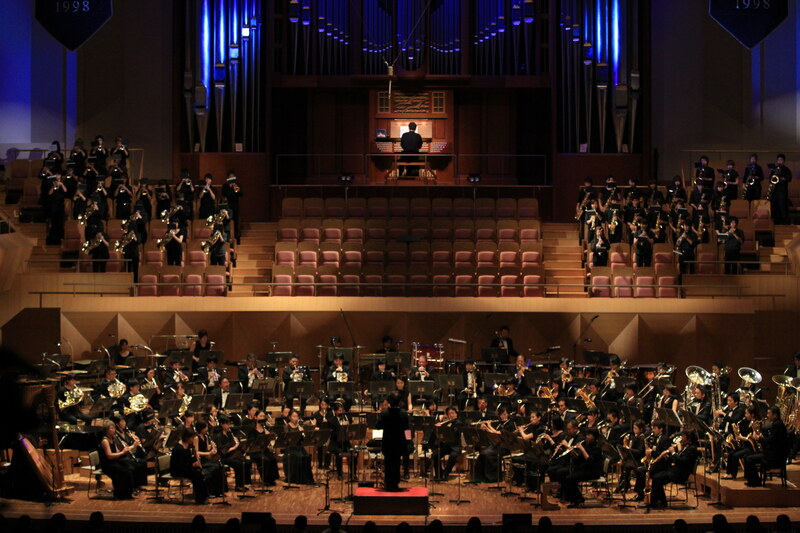 This year, we held the "Yokohama OTOMATSURI ~ Welcome to the Music Ocean" music festival from September to November, covering the whole of the city. As many as 321 programs were carried out so that you could enjoy every genre of music. ―What are your plans for the 2020 Tokyo Olympic Games? I can hardly wait. 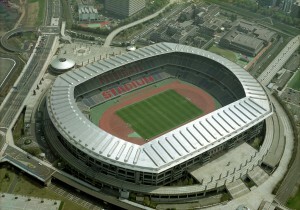 Soccer games will be held in this city. I will be happier if the players also use our facilities for their practice. Now we have a big goal, "in seven years' time." We will work tirelessly to put everything in place so that we can welcome visitors from all over the world with hospitality unique to Yokohama. The Olympic Games are not only a sports event but also a cultural event, I think. When TICAD V was held in Yokohama, we invited African people to the elementary and junior high schools in the city in the "One School, One Country" project, and created great "kizuna" bonding with them. Toward the Olympic Games, we will deepen our exchange together with the athletes and people concerned as well as with the citizens. Yokohama has about 75,000 foreign residents and is therefore a city of multiple cultures living together. 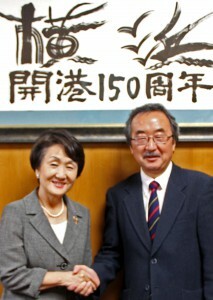 (Photo) Mayor Hayashi and President Akasaka shaking hands in front of the "Calligraphy" and congratulatory message produced in an event commemorating the 150th anniversary of the opening of the port of Yokohama, in the motif of Yokohama's scenery. *This article is based on information as of 'post date' above.